What humans experience as weight is not actually the force due to gravity, although that is the technical definition of weight. What we feel as weight is actually the normal reaction force of the ground (or whatever surface we are in contact with) pushing upwards against us to counteract the force due to gravity, that is the apparent weight. For example, a wood block in a container in free-fall experiences weightlessness. This is because there is no reaction to the wood block's weight from the container, as it is being pulled down with the same acceleration. The acceleration of the container equals the acceleration of the block, which equals the acceleration caused by gravity. When the container is at rest on the ground, however, the force on each piece of the block is not uniform. Because the block is not accelerating, there is also a force upward that arises because the block is a solid. Each horizontal cross section of the block experiences not only the force due to gravity on it, but also the weight of whatever portion of the block is above it. Part of feeling weight, then, is actually experiencing a pressure gradient (a change in quantity per unit distance in a given direction) within one's own body. Hence, in short, weightlessness has nothing to do with whether we are under the influence of a gravitational force, but has to do with whether there are force gradients across our body. In free-fall, a human experiences no weight because all parts of the human object are accelerating uniformly (assuming that there are no tidal forces). Candle flame in orbital conditions. NASA image. Gravity decreases one ppm for every three meters increase in height. Objects which are not points will feel a differential pull on their various parts. (This is actually the tidal force). In a spaceship in orbit the centripetal force is higher at the upper side. (This is also the tidal force). Objects left alone will "fall" toward the densest part of the spacecraft. When they eventually touch the spacecraft, they will stop moving and feel weight. Though very thin, there is some air at the level of the orbit, which causes deceleration due to friction. This is perceived as "weight" in the direction of motion. Left to themselves, different parts of a vehicle either side of its orbital plane are in their own orbital planes. In the frame of reference of the vehicle, this pushes objects inwards towards the orbital plane of the vehicle as a whole. The microgravity symbol, µg, was used on the insignia of the Space Shuttle flight STS-107, because this flight was devoted to microgravity research (see picture in that article). NASA's KC-135 Reduced Gravity Aircraft is based at Lyndon B. Johnson Space Center and affectionately called the "vomit comet." It is an airplane that NASA flies in six mile long parabolic arcs, first climbing in altitude, then falling, in such a way that the flight path and speed correspond to that of an object without propulsion and not experiencing air friction. This is realized by propulsion and steering such that air friction is compensated and nothing else. The result is that people inside are not pushed towards the bottom or any other side of the plane, i.e. they are temporarily weightless, each time for a period of 25 seconds. Typically one flight lasts about two hours, in which 40 parabolas are flown. NASA's Microgravity University Reduced Gravity Flight Opportunities Plan allows teams of college undergraduates to submit a microgravity experiment proposal. If selected, the teams design and implement their experiment, and students are invited to fly on the NASA's McDonnell Douglas C-9 (the recent replacement for the KC-135). The aircraft flies in the pattern described above, so that the experiment has around 20 to 25 seconds to perform its function in microgravity. The first ESA zero-G flights were flown in 1984, using a NASA KC-135 aircraft in Houston, Texas. The European Space Agency flies parabolic flights on a specially-modified Airbus A-300 aircraft, in order to research microgravity. The ESA flies campaigns of three flights on consecutive days, each flight flying about 30 parabolas, for a total of about ten minutes of weightlessness per flight. The ESA campaigns are currently operated from Bordeaux-Mérignac Airport in France by the company Novespace, while the aircraft is operated by the Centre d'essais en Vol (CEV - French Test Flight Centre). As of March 2006, the ESA has flown 43 campaigns. Other aircraft it has used include the Russian Ilyushin Il-76 MDK and French Caravelle. Ground-based facilities that produce reduced-gravity conditions for research purposes are typically referred to as drop tubes or drop towers. NASA's Zero-G Research Facility, located at the Glenn Research Center in Cleveland, Ohio, is a 145-meter vertical shaft, largely below the ground, with an integral vacuum drop chamber, in which an experiment vehicle can have a free fall for a duration of 5.18 seconds, falling a distance of 132 meters. The experiment vehicle is stopped in approximately 4.5 meters of pellets of expanded polystyrene and experiences a peak deceleration rate of 65g. Also at NASA Glenn is the 2.2 Second Drop Tower which is about 24 meters tall. Humans cannot utilize these gravity shafts, as the deceleration experienced by the drop chamber would likely kill or seriously injure anyone using them; 20g is about the highest deceleration that a fit and healthy human being can withstand momentarily without sustaining permanent injury. Weightlessness can also be simulated with the use of neutral buoyancy, in which human subjects and equipment are placed in a water environment and weighted or buoyed until they hover in place. NASA uses neutral buoyancy to prepare for EVAs (Extra Vehicular Activity) at its Neutral Buoyancy Laboratory. Long periods of weightlessness occur in a spaceship outside a planet's atmosphere, provided no propulsion is applied and the ship is not rotating. This is the case when orbiting the earth (except when rockets fire for orbital maneuvers), but not during atmospheric re-entry. Weightlessness does not occur in a rocket ship that is accelerating by firing its rockets. Even if the rocket accelerates uniformly, the force is applied to the back end of the rocket by the escaping gas and that force is transferred throughout the ship via pressure or tension, precluding weightlessness. Weightlessness in a spaceship or space station is achieved by free-fall. The ship and all things in it are actually falling towards the Earth's surface, but the orbit speeds are so great, usually five miles per second, that the Earth curves away from you before you can enter the atmosphere. However, its gravity keeps pulling you and the result is an apparent state of perpetual free fall. In the center of a planet a person would feel weightless because the pull of the surrounding mass of the planet would cancel out. More generally, the gravitational force is zero everywhere within a hollow spherically symmetrical planet, by the shell theorem. 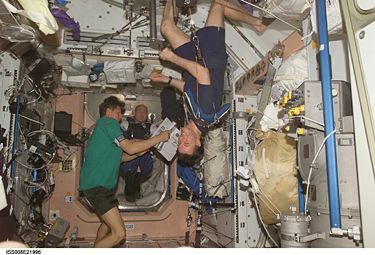 Following the establishment of orbiting stations that can be inhabited for long durations by humans, exposure to weightlessness has been demonstrated to have some deleterious effects to health. Humans are well-adapted to the physical conditions prevailing at the surface of the Earth. When weightless, certain physiological systems begin to alter and temporary and long term health issues can occur. The most common initial condition experienced by humans after the first couple of hours or so of weightlessness is commonly known as space sickness. The symptoms include general queasiness, nausea, vertigo, headaches, lethargy, vomiting, and an overall malaise. The first case was reported by cosmonaut Gherman Titov in 1961. Since then roughly 45 percent of all people to experience free floating under zero gravity have also suffered from this condition. The duration of space sickness varies, but in no case has it lasted more than 72 hours. By that time the astronauts have grown accustomed to the new environment. The most significant adverse effects of long-term weightlessness are muscle atrophy and deterioration of the skeleton; these effects can be minimized through a regimen of exercise. Other significant effects include fluid redistribution, a slowing of the cardiovascular system, decreased production of red blood cells, balance disorders, and a weakening of the immune system. Lesser symptoms include loss of body mass, nasal congestion, sleep disturbance, excess flatulence, and puffiness of the face. These effects are reversible upon return to Earth. ↑ European Space Agency. A300 Zero-G. ESA Human Spaceflight web site. Retrieved February 16, 2008. ↑ European Space Agency. Next camaign. ESA Human Spaceflight web site. Retrieved February 16, 2008. ↑ European Space Agency. Campaign Organisation. ESA Human Spaceflight web site. Retrieved February 16, 2008. Howstuffworks.com. 2006. How Weightlessness Works HowStuffWorks, Inc. Retrieved February 16, 2008. Henderson, Tom. 2004. Weightlessness in Orbit The Physics Classroom. Retrieved February 16, 2008. 1999. Gravity Creates Weightlessness? Science Joy Wagon. Retrieved February 16, 2008. 2002. 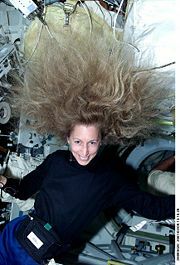 Weightlessness & More... Learning How to Survive in Space! MedicineNet, Inc. Retrieved February 16, 2008. Graveline, Duane. 2005. Weightlessness Spacedoc.net. Retrieved February 16, 2008. Zero-G Research Facility A NASA facility for ground-based microgravity research. NASA Microgravity University A NASA student program that allows teams of college students to plan a microgravity experiment and fly on board NASA's C-9 The replacement aircraft for the KC-135. This page was last modified on 9 August 2013, at 23:25.